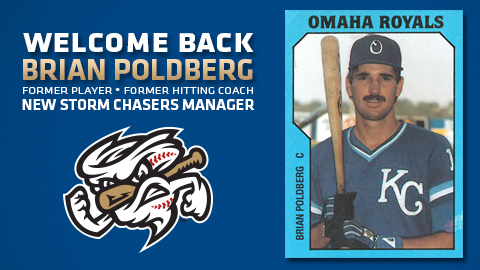 Poldberg is the sixth manager in team history that has also played for Omaha, and trails only Ron Johnson's 329 games for the most as a former player before becoming manager. OMAHA, Neb. - Following the promotion of longtime manager Mike Jirschele to Major League Coach, the Kansas City Royals have announced Brian Poldberg as the next manager of the Omaha Storm Chasers, the 18th skipper in franchise history and fifth since joining the Pacific Coast League. Pitching Coach Larry Carter and Hitting Coach Tommy Gregg will return in the same roles for the 2014 season. The promotion is Poldberg's first to a Triple-A manager position after leading the Royals Double-A Affiliate, the Northwest Arkansas Naturals, for the last six seasons compiling a record of 424-412. He guided the Naturals to four straight Texas League postseason appearances from 2008-11, winning the 2010 Texas League Championship. Poldberg is a Carter Lake, Iowa resident and the 56-year-old was originally born in Omaha. "If you were going to replace a manager like Jirsch, we could not have hoped for anyone better than Brian Poldberg. He is one of the few members of the Kansas City organization with strong ties to the Omaha area, and we are thrilled he will lead his hometown team," said Martie Cordaro, President and General Manager of the Storm Chasers. "He not only has experience managing a majority of the players who made up our 2013 roster, but he also brings with him the knowledge from his time on the Royals Major League staff. This is the start of an exciting new chapter." During his time at the helm of Northwest Arkansas, Poldberg managed 29 of the 53 players who appeared during the Storm Chasers 2013 season (including the playoffs) and 20 of the 43 players who suited up for the Kansas City Royals in 2013. He spent 2004-07 on the Kansas City Major League staff working as Bullpen Coach in 2004-05, First Base Coach in 2006 and Third Base Coach in 2007. Poldberg began his coaching career in 1987 and managed at multiple levels of the Kansas City organization from 1988-1996, with the exception of the 1991 season where he served as Omaha's Hitting Coach under manager Sal Rende, and was also manager of the Wilmington Blue Rocks during the 1998 season. He has worked as the Royals Minor League Catching Instructor for a total of seven seasons. Poldberg played for the New York Yankees and Kansas City Royals organizations across seven seasons totaling 382 games, but never reached the Major Leagues. He was a catcher/first baseman for Omaha during the 1983-1985 seasons, playing in a total of 179 games. Poldberg is the sixth manager in team history that has also played for Omaha, and trails only Ron Johnson's 329 games for the most as a former player before becoming manager. The move reunites Poldberg with Larry Carter, who served as Northwest Arkansas' Pitching Coach during the 2008-2012 seasons. Poldberg will make his Storm Chasers manager debut when the 2014 season kicks off against the Nashville Sounds on April 3, a team Poldberg spent two seasons with as a player in 1981-82 when the Sounds were still a Double-A affiliate of the Yankees.